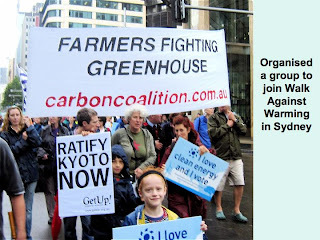 Carbon Coalition Against Global Warming: "I'm blown away by your energy and commitment. Your excitement is infectious..."
"I'm blown away by your energy and commitment. Your excitement is infectious..."
A couple of days ago we received a cheque through the mail and a letter from a supporter who wrote: "I'm blown away by your energy and commitment. Your excitement is infectious and your research formidable..." It continued, "Thanks for soldiering on, on behalf of us all... You are providing such a wonderful public service in pulling all the carbon stuff together." I was stunned. 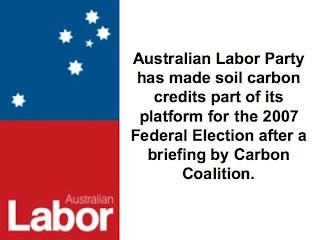 All the worrying about money through the drought and the mounting cost of continuing the campaign for recognition of soil carbon had been eroding my confidence. Would we be able to finish what we had begun? We can't continue like this. The bank manager agreed when he visited last week. The sight of that cheque made me quite emotional. 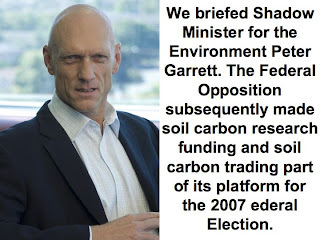 While I take as much off-farm work as I can get, the needs of the Carbon Coalition campaign - the documents, the research, the meetings, the speeches - make earning a conventional living impossible. Why am I telling you this? It's been my choice. I am driven by the fear of leaving my two young grandsons to cope with climate crisis in a dangerous world. 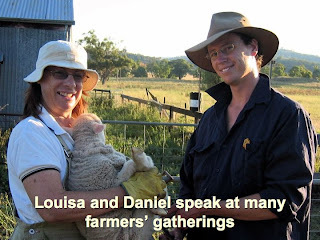 I am driven by the chance we have to bring farm landscapes back from the brink right across Australia. I am driven by the feeling that our community is disintegrating as the local economy declines and with it government services and things city people take for granted, like banking services. 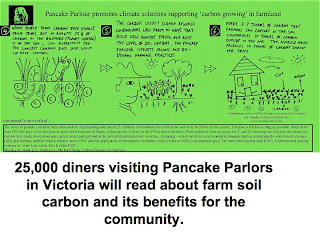 And the opportunity for restoring life in agricultural communities, funded by big city polluters via carbon credits. A thunderclap went off in my head when that cheque fell out of the envelope. I realised that some people might value what we are doing... enough to help us pay for it. So, in the bush tradition, we're passing the hat around. It's a bit embarrassing to be passing the hat for yourself, but the cause is more important than personal pride. If it comes back empty, that's OK. We'll soldier on anyway. 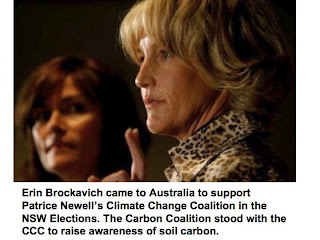 • You can use a credit card via the “Make a Donation” button on this blogsite (http://carboncoalitionoz.blogspot.com) and the website (www.carboncoalition.com.au). 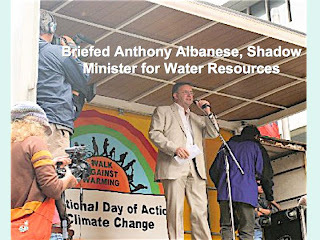 • You can engage the Coalition to provide speakers for seminars or to run workshops about carbon trading and agriculture. Call 02 6374 0329. 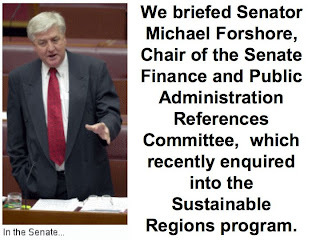 • You might know a corporate or philanthropic organisation we could apply to for financial support. 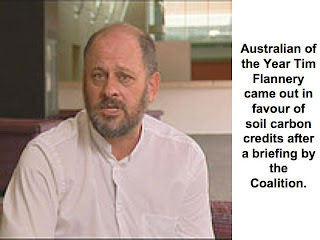 • You can buy Australian Farm Soil Credits from www.adoptafarmer.com.au - a percentage of each sale goes to support the Coalition's work. PS.Below we list the ways your support will help. PPS. 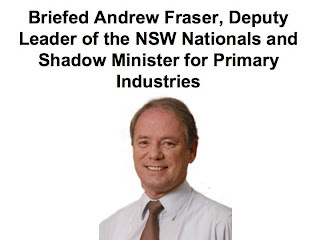 Also below is a complete activity report on the Coalition's performance since February 2006. 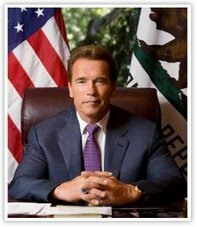 The Carbon Coalition needs your help! 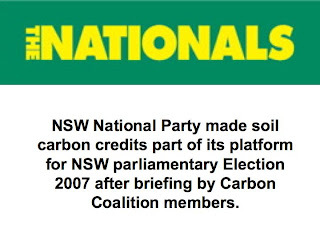 Soil carbon credits are now on the national agenda. The work of the Coalition is paying off. We have the support of the Federal Opposition. We are knocking on the door of the Federal Government. 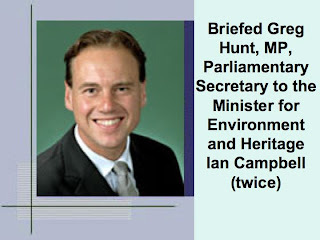 We finally have the ear of the Australian Greenhouse Office. We can't stop now. 1. 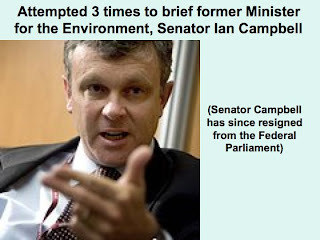 Being fobbed off with Stewardship Payments instead of carbon credits. 2. 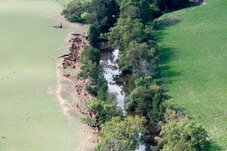 Missing out on offsets when on-farm emissions are estimated and landholders are required to buy credits to offset CO2, methane, nitrous oxide etc. 3. 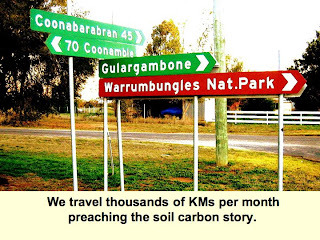 Put an end to the myths about Australian soils and carbon. 4. Force the hand of the regulators by forming markets. 5. 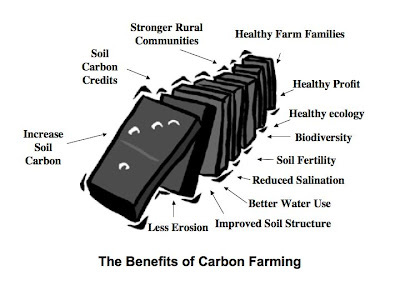 Promote Carbon Farming among business as usual growers. 6. 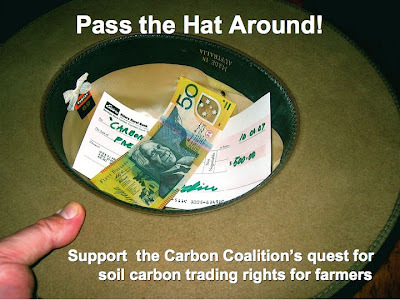 Teaching landholders about the carbon trading markets. NB. YOUR TAX DEDUCTION: While we cannot offer tax deductibility as a CHARITY, we can arrange a deduction for you by the following means: 1. You make your contribution. 2. 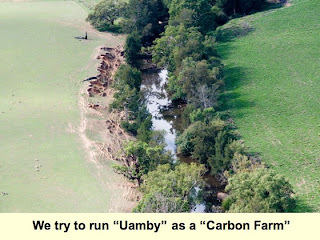 The Coalition invoices you for CARBON ADVISORY SERVICES and your receipt can be used for deduction. 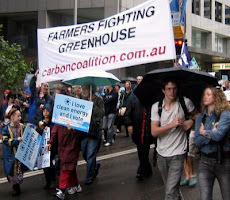 February, 2006 - Launched Carbon Coalition at Central West Conservation Farmers’ Association conference. 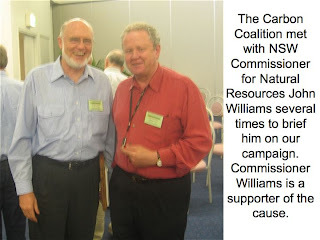 April, 2006 - Recruited Coalition Council members as advisory board: David Marsh, Rick Maurice, Col Seis, Angus Maurice. 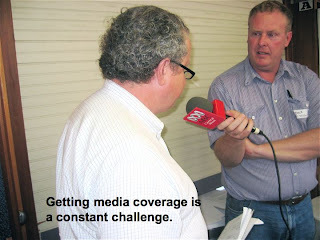 Reguler press releases to national and rural media. Interviews with media. Add extensive “Library” of scientific papers and links to website and blogsite. 29 September: Swanton, Vermont - Address Farmers' gathering organised by Coalition member Abe Collins from Vermont. Susan Capalbo, Director, Big Sky Carbon Sequestration Partnership. Pamela Tomski is Associate Director responsible for outreach and education, Big Sky Carbon Sequestration Partnership. Dave Brown, Technical Lead, Terrestrial Sequestration with Big Sky. Michael Bowman, Director, 25:25, a movement that aims to have 25% of America's fuel needs supplied by farmers in 25 years. Ted Dodge, Director, National Carbon Offsets Coalition which brokered the first carbon credits paid to US farmers In Montana and Kansas. 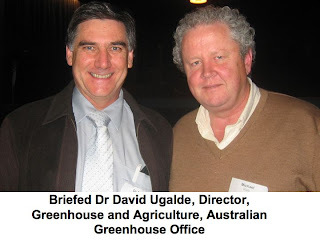 Professor Bruce McCarl of Texas A&M University, climate economist on the Inter-Governmental Panel on Climate Change. 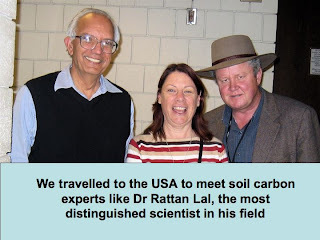 Dr Rattan Lal, author of a small library of books and papers, co-author of many others, Professor of Soil Physics at the School of Natural Resources at Ohio State University, Columbus Ohio. Dr Klause Lorenz, Senior Research Fellow, the School of Natural Resources at Ohio State University, Columbus Ohio. 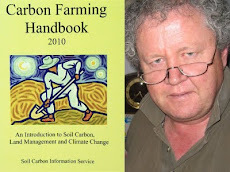 Launched Carbon Coalition in USA - Abe Collins, Carbon Farmer and Convenor, Swanton, Vermont. Attended and addressed 2 day Phase 2 Workshop in Albuqurque, New Mexico of the Southwest Regional Partnership. Met with Head of Partnership, Dr Brian McPherson, from the New Mexico Institute of Technology in Socorro. Met with Dr Joel Brown and Dr Jay Angerer, the 'soil carbon sequestration' experts with the Southwest Partnership. Met with Peter Holter, Holistic Management International. 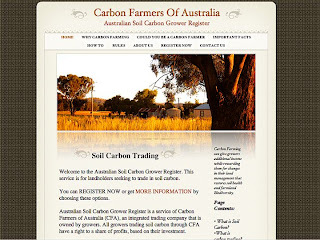 Secured first order for 25,000 acres Australian soil (till to no till) from CCX. 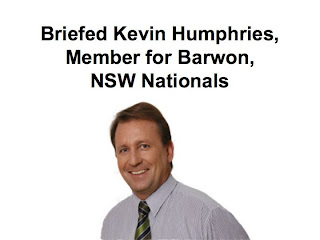 Submission to Commonwealth Minister for Environment, Sen. Ian Campbell via Parliamentary Secretary Greg Hunt, MP. 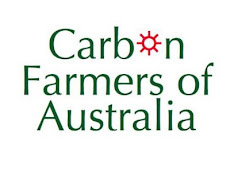 Coordinated 8-farm application for CWCMA Round 5 funding for carbon farming soil trials. 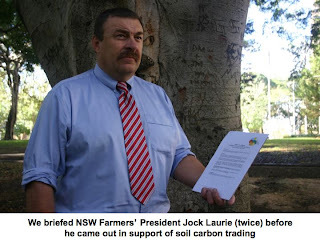 19 December, 2006 - Briefed NSW Farmers’ Asociation’s Jock Laurie. 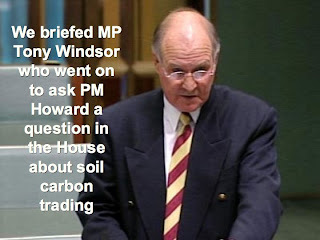 Subsequently calls for soil carbon credits. 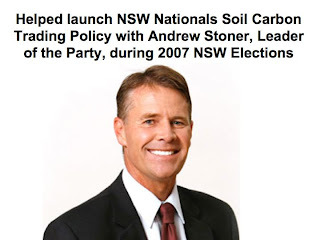 Stand for NSW Legislative Council elections for Climate Change Coalition as soil carbon advocate. 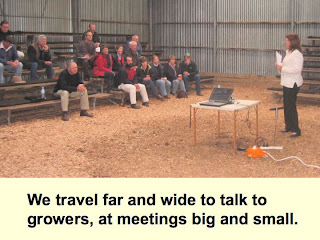 2 April, 2007 - Teleconference with organisers of second soil science summit. 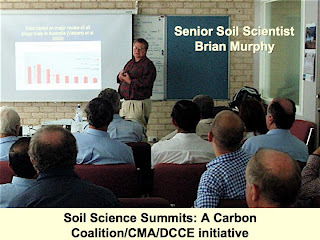 4 May, 2007 - Teleconference with organisers of second soil science summit. 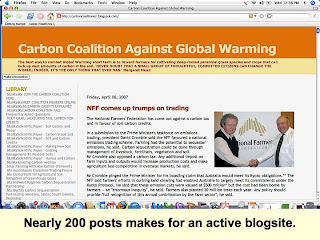 • You will find a “Donate” button on this blogsite (http://carboncoalitionoz.blogspot.com) and the website (www.carboncoalition.com.au). Your contribution is an investment in the greatest opportunity to address Climate Change and solve the problems of declining land health, declining economic health, and declining personal health in agriculture.